Native to Europe and western Asia, yarrow was traditionally used to treat wounds, although it was also once used in Germany and the Nordic countries as an alternative to hops in beer-making. Today it is valued for its astringent and anti-catarrhal properties, and is used in remedies for colds and urinary disorders. It is widely naturalised in North America, New Zealand, and Australia. 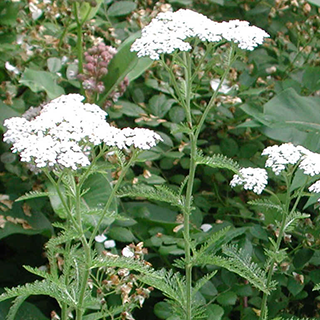 Yarrow is a classic homeostatic and antiseptic, used for treating bleeding, whether from internal causes or from deep wounds. It is also a bitter tonic and antispasmodic, and will improve digestion if taken prior to a meal. Hot yarrow tea is also taken for treating colds and sweating out fever. Drink 1 cup (1-2 tsp herb per cup of boiling water) 3 times a day to encourage sweating and reduce fevers; combines well with peppermint for common colds. One cup stimulates the appetite. Take 20–40 drops (1–2 ml) 3 times daily, usually with herbs such as couchgrass or buchu, for urinary disorders. A single leaf inserted in the nostril will rapidly stop a nosebleed. Apply to minor cuts and grazes. Add 10 drops of yarrow oil to 5 tsp (25ml) of infused St. John’s wort oil to make a rub for hot, inflamed joints. Use 1 tbsp fresh flowers in boiling water to ease hayfever symptoms. Inhale the steam for at least 2–3 minutes. Prefers a well-drained position in full sun, but is tolerant of a wide range of conditions. Sow seeds in spring. Propagation by root division is best in spring or autumn. It can easily become invasive.